Many of our churches spend thousands of dollars each year to make trips to other countries to experience ministry in a different culture. We encourage that ministry and those partnerships. But I would like to suggest that there are some other options that will accomplish similar ministry objectives. Why not consider sending some youth and adults to minister with Pastor Rubenia Bomatay and her Hispanic folks in Jamaica Plain, Mass.? Our New York cluster group gives you Jamaican, Chinese, and Sierra Leonean options. Last year, Todd Yoder, youth pastor at Jerusalem Chapel (Churchville, Va.), took a group to work with our Bethel church in Yonkers, NY. Call and ask him what that experience did for their youth. Have a blessed Thanksgiving! See you next Monday. Randy and Toni Fennig have been in Sierra Leone for two months now. However, their shipping container has been stuck at the port, awaiting release by the government authorities. The container includes a tractor. This week, Randy was told that in order to process the contents of the container, they need the tractor’s vehicle identification number. Since the tractor is packed at the back of the container, they’ll need to unload the entire container. That means placing the contents out on the dock, with lots of people milling around, until they can reach the tractor. So that’s a concern. Pray that the container can get processed quickly, and that the Fennigs will receive everything they packed. Recently, the First Lady of Sierra Leone invited Billy Simbo to the presidential residence in Freetown. She was interested in having her foundation come alongside Mattru Hospital. She has a particular interest in pediatric health and in lowering infant mortality rates. The First Lady expressed her interest in developing a working relationship with the United Brethren church in Sierra Leone. She is a United Methodist member, and her husband is a member of the Wesleyan church. Although the meeting went well, Billy didn’t get his hopes up. He didn’t even bother telling me about the meeting. But then he received a letter from the First Lady’s office confirming everything they had talked about. We don’t know where this will lead, but it certainly can’t hurt having the nation’s First Lady on your side. George Rhodifer sent this update on his condition. George is pastor of Olivet Church in New Lebanon, Ohio. In early September, he was diagnosed with bone marrow cancer and given three months to live. Dan Drake has been appointed as senior pastor of Olive Branch UB in Lakeville, Ind. Emmanuel Community Church is hosting a free concert featuring rock band Attaboy and indie-rock newcomer The Fabulous at 7 p.m. on December 5. Three of the four members of Attaboy, a Huntington-based alternative rock group, are graduates of Huntington University. Vocalist/keyboardist Amos Caley, who holds a degree in Bible and Religion, is the son of UB pastor J.
Michael Caley (Banner of Christ UB, Byron Center, Mich.). The concert is open to the public and is sponsored by Huntington University, Remedy.fm, and Emmanuel Community Church Student Ministries. A few days ago, I mentioned something Andy Stanley said concerning momentum. Here’s another one of his thoughts. In the church world, we put up with lack of momentum as long as we can still pay the bills. Now there’s a sad thought. “I am financially viable, therefore I exist.” Is your church in that boat? Too many churches choose to limp along, keeping the doors open, as long as they can pay the bills. The only momentum is downward. Meanwhile, they shoo away opportunities which would be to their long-term good–like merging with a nearby church. Such a move would make both churches stronger. No longer stuck in survival mode, they could devote resources to ministry. Marie Mellott passed away Sunday evening, November 23. She was the widow of Rev. O. Guy Mellott, who pastored the Heidlersburg UB church (Heidlersburg, Pa.) for over 20 years. For a short time, both Marie and Guy pastored the Mt. Olivet UB church in Aspers, Pa.
Memorial Service: Saturday, November 29. 10:15 – noon. Location: Heidlersburg UB church, 2725 Heidlersburg Road, Gettysburg, Pa.
Officiating: Revs. Dan Summers and Phil Byers. This chart shows the average attendance in United Brethren churches since 1960. In the United States (the blue lines), we climbed to a high point in the mid-1970s, fell to a low point in the mid-1980s, then gradually grew back to a new high in 2004. What does it all mean? The sharp decline after 2004 no doubt relates to our efforts to join the Missionary Church, and the aftermath (when a number of churches withdrew). But it looks like we have stopped the hemorrhage, and are growing again (albeit with a smaller number of churches). Notice the green line, too–the worldwide attendance. 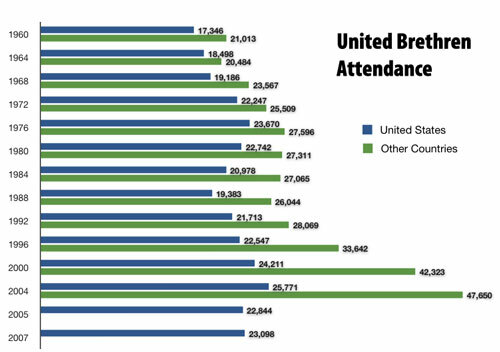 Although the United States attendance hasn’t grown very much, the overseas work has done well. And most of our overseas churches are an outgrowth of the US churches. The ups and downs in charts like this are open to lots of interpretation. Factors such as leadership, emphases, generational changes, and demographics can all play a role. We welcome your own interpretations. Leave a comment.